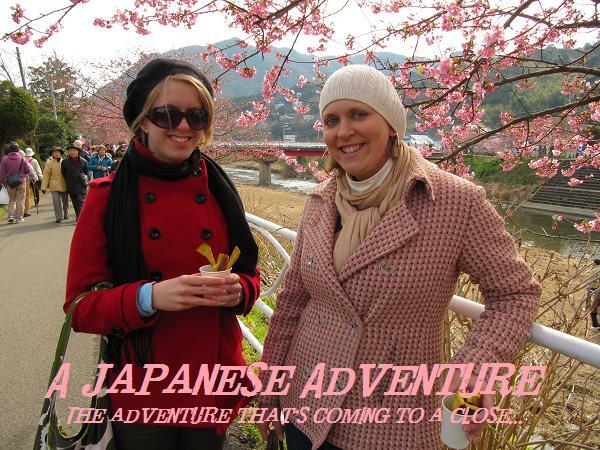 I'm closing out the sister adventure blogs, though long overdue. This seems to be a trend for me, but a week's worth of travel is hard to pack into small blurbs! Sarah and I were able to make it over to the Shimizu port area in my prefecture, about an hour's drive through city-ish traffic. We drove up to Nihondaira lookout, which usually has a great view of Fuji and Suruga bay. Unfortunately for us, Fuji wasn't out to play, but we took a ropeway across some trees changing colors to a nice Toshogu shrine and later that day were able to see Fuji on a "bay cruise" at the port. I've been wanting to do this for awhile, so it was great to do something new in my area. I need to do more things like this -- finding things in my area to explore. It's easy to get set in your ways and not seek out these mini-adventures! I hope you enjoyed it as much as me, Sarah! Suruga Bay and probably what would be Mt. Fuji were it not cloudy. There were tons of sea gulls getting food from the tourists on the boat. I think you could buy food to feed them...I just took pictures instead. The sun getting ready to go down. After a long day of sightseeing, we were off to meet my friends for a night out on the town. We met up for dinner and drinks at our local Australian bar. It was a great day near the end of Sarah's trip!